This game was made for back-benchers! I swear! When we were in school, the most boring class begged for this game. But only those fortunate to sit right at the back could manage; the rest would play the game with these big, fat textbooks outside of class. Flip – stop – flip – stop – flip – stop… was all we’d do, and voila! An entire game of cricket, complete with wickets, batsmen, balls would be spread out right through the book. 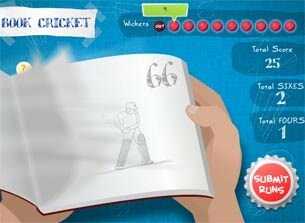 TheGameBox revives this super fun game in the form of Book Cricket. Clean, bright and simple graphics keep the game looking fresh while the easy-peasy yet fun game-play keep you hooked like. no. other!! Click on the book to start flipping the pages. Click again to stop. The last digit of the page number denotes runs: so, if you stop on page number 34, you score 4 runs; 6 runs if you stop on 56. If you stop on pages ending in 8, you score 1 run; likewise, if you stop on a page ending in 2, you score 2 runs. You lose a Wicket if you stop on a page ending in 0. Simple? Yes! Fun? Yes!!! Tell us how you like it. Cheers, you guys!